Looking for some garden party ideas? 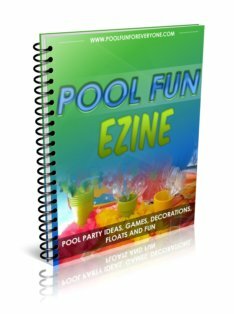 This is a great themed party for any type of outdoor gathering. Choose a time when your garden is looking it's best and when the weather is not too cold or not too hot. Our best time is in June when all of my blue and purple hydrangeas around the pool are in blossom and the humidity is still low. 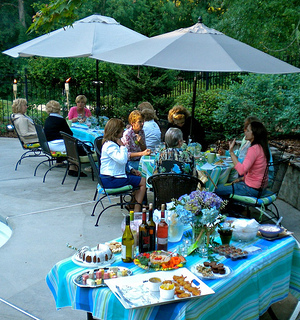 Show off your garden perennials and flowers by hosting your party when they are in peak bloom. Guests and visitors love to see our hydrangeas and it is especially true when you have a group of women getting together for a garden themed party. 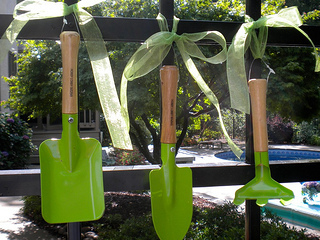 When it comes to garden party decorations, a picture is worth a thousand words. 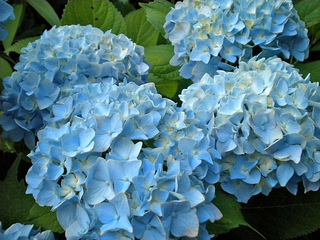 I use my hydrangeas and other greens for the party decorations and the flowers determine the color of the paper goods. Garden party decorations need to include ... of course lots of flowers. 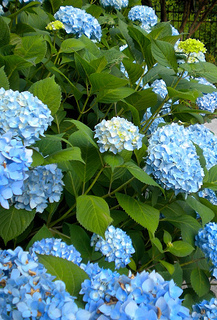 I love to share the beauty of my large leaf hydrangeas - blue and purple ones. 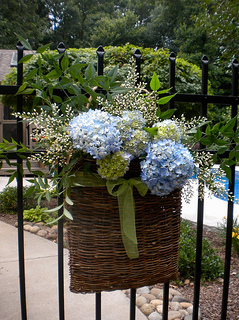 Greet your guests at the garden gate with a bouquet of flowers in a wicker hanging basket. 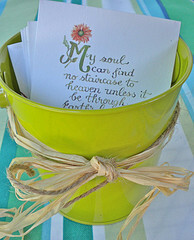 Place a large freezer ziplock bag inside the basket thats filled with fresh water and then arrange your garden flowers. 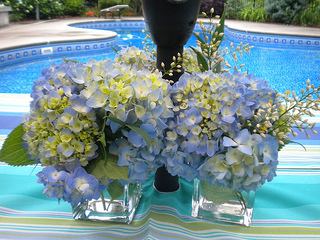 The mophead hydrangeas become the showcase and are used as centerpieces on all of the tables. These flowers need to be cut in the early morning before the heat of the day wilts the blossoms. They even greet the guests right at the pool gate in this hanging basket. Your fresh flowers will be the main decorations for your tables and food table. 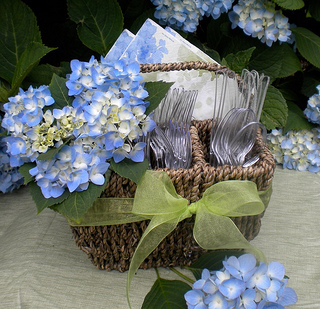 Small clear glass vases are filled with hydrangeas and placed around the umbrella pole at centerpieces. Be sure to have plenty of tables and chairs for all of your guests. We brought out our porch table and chairs so that everyone had a chair to sit in. Have a separate table just for food and drinks. Select a color scheme based on the flowers you are using - my decorating all centered around my blue and purple hydrangeas. Use the same color or patterned tablecloths. We used blue, green and white striped umbrella tablecloths. 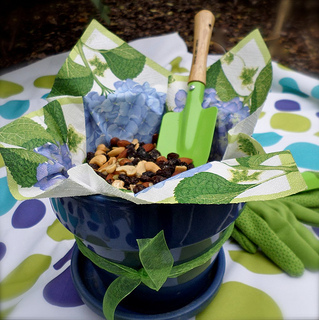 Serve your snacks in colorful new garden pots lined with a floral napkin. I placed a small bowl on the bottom of this deep pot and then placed a hydrangea napkin on top. Put in your snack and then serve it with a new garden trowel. I found this one at Target in their dollar section in the spring. 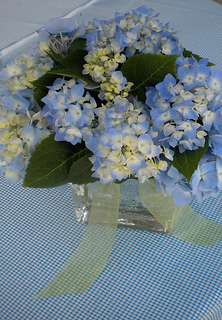 Put a disposable plastic cup in one of the compartments, fill it with water and add a single hydrangea blossom. Tie a bow around it for extra color. I found some hydrangea floral napkins and matching dessert plates that carried the hydrangea theme. 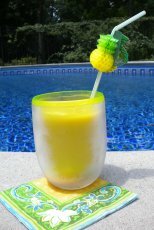 If you use patio tables with umbrellas you will need umbrella tablecloths that have a hole in the middle with a zipper. The more expensive ones are made out of fabric while the less expensive ones are made out of vinyl. Either way use one that is not too busy, so you can show off your flowers. 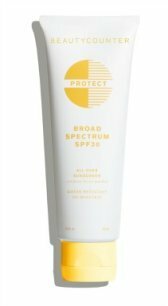 Inexpensive ones can be found at K-Mart, Bed Bath and Beyond, Target and Tuesday Morning in the spring. 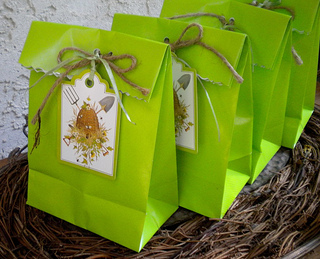 Inexpensive green bags embellished with a garden tag made great themed party bags. Trim the tops using a decorative scissor and fold it over. Punch two holes in the middle of the bag and use twine cord to make a small bow tie. Flower wine stoppers made the perfect garden party favors. You can either provide each guest with their own party bag, or have just a couple made up for the winners of some fun and easy games. As each guest arrived, she was given a small, garden themed note card and instructed to find the person who had the same matching card. When the two guests found their match, they were instructed to share with each other the name of their favorite flower and why they liked that flower. Several of the cards had a "W" on the back. 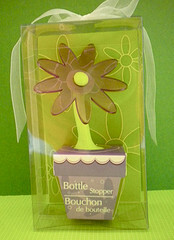 Those who had the card with the "W" were each given a party bag with the flowered wine stopper. Another ice breaker is to have several garden themed poems like the one's below. Each guest is only given half the poem and need to find the guest who has the other half of the poem. When the two guests match up instruct them to share their favorite gardening tip. Here are some poems we used. Oh, spring came to my garden And caught it unaware Wearing just a few old leaves And a dejected air. But when spring left my garden, Its work so deftly done, Many, many Daffodils Were dancing in the sun. Soft breezes blow the garden through, The leaves and blossoms sway and nod. And I catch my breath, as I watch them sway Tossing their sweet perfume. The robin's song at daybreak Is a clarion call to me. Get up and get out in the garden, For the morning hours flee. A type written quiz with these questions were given to each guest, with a prize for the one who answered the most questions right. In the garden party invite instruct your guests to bring a perennial plant to exchange. Most guests brought one but others did not. Those that brought one could take one home. 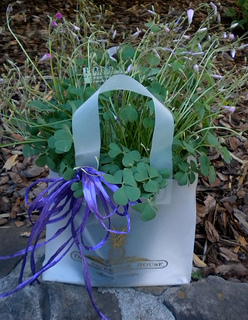 Guests were told to just dig up a perennial in their garden, but some guests bought theirs - like this one that looked so pretty in a plastic gift bag. Others indeed dug up a favorite day lily, Black Eyed Susan, or mum so they could participate in the exchange. As each guest left the party, those who brought one picked a perennial to take home. If your party continues on into the evening, be prepared with outdoor party lights. My favorite party lights are submersible LED tea lights. They have been used many times and are still going strong. I bought a set of 36 and used them at each of the party tables. 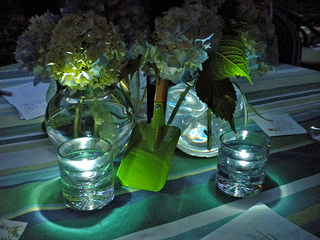 Small clear votive glasses were filled with water and one of the bright LED lights was placed in each votive. They gave a wonderful, long lasting glow to the tables. I also placed several of them in the each of the clear glass flower vases for more light. Everyone loved them and wondered where I had got them. If you love the idea of hosting a garden party, pick a month when your yard or pool area looks the prettiest and has the most bushes, perennials or annuals in blossom. Use the blossoms for your table decorations and let your guests enjoy the colorful landscaping. Our garden party started at 7:00 PM so outdoor party lights were important to keep bugs away and for lighting up the pool area. 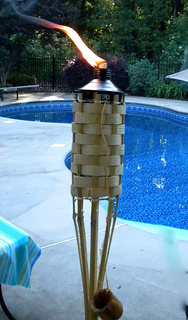 We set up tiki torches at the garden arbor to help direct guests to the back of the house. Outdoor torches were also set up at the pool gate and by the steps leading to the pool. Place torches several feet apart near the seating area to bring light to the party and thanks to citronella oil, helps to keep bugs away. Inexpensive bamboo torches will last for the summer season and longer if you bring them into the garage and store them after each party. Led solar garden lights aren't just for parties, they provide light and pleasure every evening as the sun goes down. We have had these solar path lights by Plow & Hearth for 3 years now. They come in a set of 4 - so we needed two sets for the path to our pool. 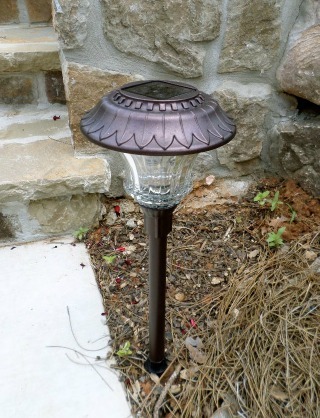 While they cost more than other solar lights, they give off more light to your garden path and last through the night. After about the 3rd year one of the lights stopped working so we replaced the battery and it's as good as new. These high quality glass and bronze (or zinc if your prefer) garden lights add style and light to any garden - every night. Start planning and celebrate the beauty of your garden with these garden party ideas. 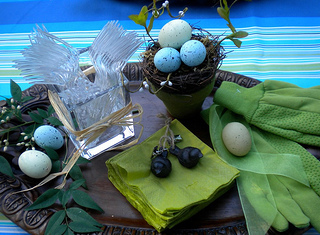 Share the beauty of your garden with friends or neighbors with a garden party theme.